Invite Thomas the Train to your party with our beautiful Thomas Train Jumper. It's the perfect choice for your Train or Thomas & Friends Train Party. 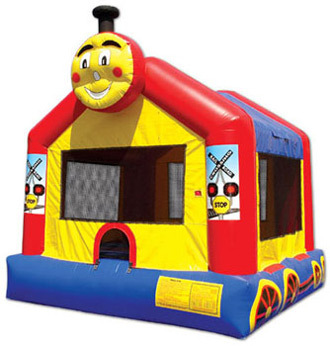 We from BounceHousesForRent.com will provide you with this new and clean Thomas and Friends Train Jumper. Our price includes delivery, setup, and pickup within our delivery area. We serve parts of Los Angeles County and Orange County, California. I will never rent from another company again. The cleanest I've ever rented. My son Loved it! Prompt, efficient delivery. Excellent product. Made the party. The kids had a blast in it. Love go Jumper! best company. Clean jumpers. no hassle. This is my 5th year in a row with them! The jumper was a big hit with the kids. We couldn't get them out of it.